If you have five minutes, watch it. If you have an hour, watch the whole race (start at the 1:00:00 mark) as the announcers realize that Caitlin is in position for a podium and are utterly shocked by it. Caitlin is a friggin’ rock star who, through various happenstance, has been on the outside looking in way more often than she should be. She skied at NMU because back in the early 2000s, that’s what you did: ski in college. (I vaguely remember watching her start a race in Ironwood and smoking the field.) Then she was told she should have been on a development team, and was too old to be supported. She was selected for the Olympics in 2010—I interviewed her on a sketchy Skype connection for the Loppet newsletter a few weeks after—but only at the last minute after she had skied fast enough that they couldn’t rightfully leave her off (again she was “too old”), and then had to pay her own way to World Champs. In 2011 she won the Birkie (note to November Project types: the temperature—not windchill, temperature—was -11. Can you say ‪#‎weatherproof‬?) and 2013. In 2014 she was left of the Olympic team because of, among other things, internal politics, and she was too old, (although her husband got to go to Sochi). I asked her last year if she was considering another run at the Olympics in 2018 or hanging up the—well, not the spikes, bindings? let’s say bindings—and she was only a little non-committal: 37 is old even for skiers, but especially for US Ski Team selection. Good thing she kept after it. Caitlin and Brian—Team Gregg—are also super-active in the community, working with the Loppet Nordic Foundation and hundreds of at-risk youth in Minneapolis. Caitlin rollerski trains on residential streets in Saint Louis Park (yup, I went out with her once, and it was not easy to keep up). After a swooping hill where I was trying not to crash she says “it’s nice, these hills remind me of the World Cup courses.” A suburban street west of Minneapolis. She represents the best there is of citizen athletes. This year, she skied her way on to the World Championship team—even still, there were lingering questions about whether they’d take her. And today, she showed that she belonged on the track. This is no disrespect to anyone else on the team: Jessie Diggins had an amazing race (we expect greater things! ), and all four American women were in the top 15. (Charlotte Kalla smoked everyone, of course.) Did the snow matter? Sure. But the skier makes the skis fast. For those of us watching Jessie win high school races in Minnesota, it’s especially cool to watch her perform at such an elite level. But for Caitlin, it is years of vindication: she more than belongs. Yes, Charlotte Kalla will be above the fold in every newspaper in Sweden (and deservedly so). But guess who’s flanking her in every picture? Not Marit. Not Therese. Jessie and Caitlin. The day belongs to the American Women. And I hope we’re not done seeing great things from any of them. 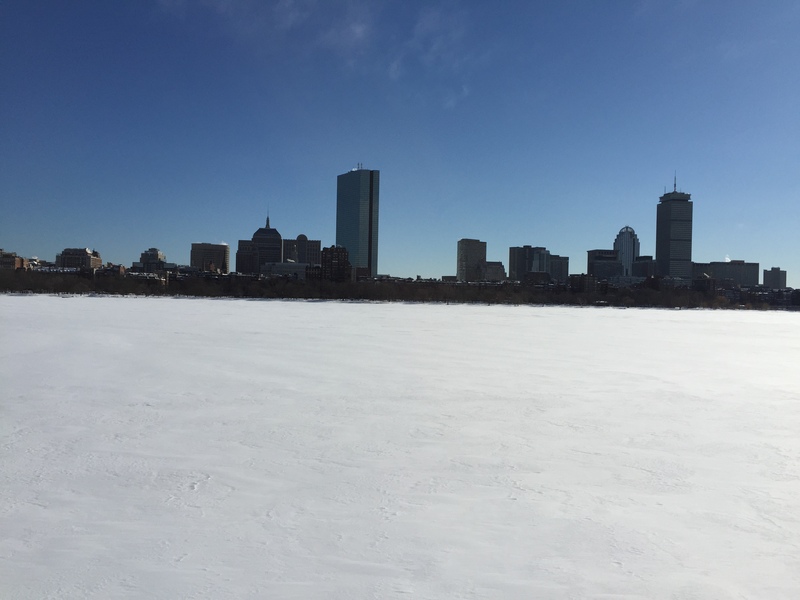 This morning, I went out for a crust ski on the Charles River. I’m not kidding. The river is well frozen, and the crust has seen enough sun and moisture that it’s pretty perfect. A couple frozen drifts here and there, and some ice under the bridges. It’s pretty great. I might call for a ski race on it some time this week. Then I got to my office and turned on the Internet and Caitlin and Jessie had broken the Internet. This is pretty awesome. Caitlin won the Birkie in 2011 and 2013, and Jessie the Korteloppet in 2008 and 2009. That’s four Birkie event wins! To have them both on the podium, and with significant payouts too ($10k and $6k), is really fantastic. A great day for US skiing. This page interviewed Ms. Gregg last year, and maybe she and Jessie will join us again soon (maybe for a podcast; yeah, we might start doing podcasts). You skied the Birkie. You told all your friends about it. Why not tell the world on BirkieGuide.com? Well, why not? Because you send me a PDF with embedded images. Or a Word Doc with weird alignments. Newsflash! Every race report sent to me gets parsed manually to HTML and then posted. So if you send me a PDF and it has weird line breaks, I have to remove those by hand. Which means your race report doesn’t get posted, and the world doesn’t find out about how you totally smoked that dude in the feed at OO. Please send me text with as little formatting as possible. I have to get it Internet-ready, so a PDF with in-line photos really doesn’t work. Sending the text in a plain word doc or the body of the email is best. I’m drawing the line this year. If I have to pull out carriage returns and such, I’m not posting it. Sorry. I’ll post photos, but please send them as separate attachments. Proofread! Please proofread. I have to proofread, and if there are fifteen spelling mistakes on the first page I might give up. Consult a style guide. Use em dashes (—) and elipses (…) not double hyphens (–) and treble periods (…). And single spaces after punctuation. I’m amazed that is still a thing. Keep it clean, and not ad hominem. If you want to call out a person who didn’t let you pass on a hill at 20k, don’t mention their number or name, unless it’s a buddy of yours. Note that we are looking a the possibility of setting up a blog-type interface where you can input your Birkie story (and anything else under the sun or moon), but haven’t yet figured out if this install of WordPress supports that. For now, please email stories to ari.ofsevit @ gmail. And I promise we’ll get them up faster than last year. I’ve met a lot of people in the past few days, and if I mention BirkieGuide, it’s amazing, but almost without fail, people say they’ve read the site and love it. That’s great—and heartening, this site doesn’t write itself. I’ve even had people who I guess heard my name and came up to shake my hand. Guys, go find the winners and do that. Or the guys who’ve skied 40 races (I’ve now done 10). But, yeah, thanks again! See you in Seeley! A couple years back, I wrote about how the Birkie really needed to fix parking and busing situation. Then last year happened. I spent some time this past summer talking with the Birkie, and a team from Georgia Tech, about fixing the parking. (It helps that it’s kind of what I do for a living in the real world.) My idea was basically that they needed to split the parking and not have two streams of parking trying to access one road, and minimize the left turns and crossing traffic. The Birkie, using their new trailhead, did one better, parking northbound traffic at the Birkie Ridge trailhead. And you may have noticed: it worked. It helped that there was 1.8″ of snow this morning, not 18″ inches. But, on a daily basis, I see traffic which increases by 10 or 20% and goes from free-flowing to gridlock. The Birkie was over capacity. By cutting it in half, they brought it way under capacity. It works. I talked to Ben Popp and he said that, at one point, he saw a line of people waiting in traffic and was disappointed. Then he realized it was only 18 cars, and they were moving. That’s not an issue. The hour-long backups, those are the issues. Last year, it took us 1:45 to get from Hayward to Cable. This year, we made the trip in 25 minutes (it helped that we were traveling with an elite elite racer who had a start parking pass, but even with the buses, it would have been less than 45 minutes, or an hour less than last year). It was a huge success. Parking is one of the biggest constraints on the capacity of the Birkie, and it has been dramatically improved. And, yeah, I’m taking just a bit of credit for that. More on the race, of course, later. FWIW, 154th, best finish ever. Looks like a pretty good day for the Birkie tomorrow. The temperature is now above 0, and looks to stay above 0 during the race tomorrow (it was certainly not above zero this morning, nor will it be above 0 on Sunday). The trail is in perfect shape: not as much snow as last year, but good conditions. The skate deck is very hard, but there are 2 or maybe 3 inches of powder on top, which should be incorporated in to give a nice pliable but firm skate deck. Conditions a la 2011. It’s likely to be a great race. And the bridge. If you just went to the expo, you may have missed the Birkie bridge. But it’s impressive. No more will you just glide off the lake, around Marketplace and up Main Street: you now have a 20 foot climb. And then there’s a steep drop down on to Main Street for the finish before you have some momentum for the now-one-block-longer trip up to the finish. Usually the Birkie posts information about the trail being closed some number of days before the race. This year I haven’t seen any information. So apparently the trail is open this afternoon. It’s probably a good idea to clear off of it by 3 or 4, as the groomers will be coming through for their final rounds to set down the skate lanes with the new snow. And to eat and get read to ski tomorrow. The Birkie is Saturday. The forecast low temperature on Saturday morning? 10˚. That’s cold—a couple degrees below average—but not too bad. We’re very luck the race is two days later. While the race has started in temperatures around or a bit below 0, there’s no way the Birkie could have held the race today without a significant delay. But the race can’t be pushed too far back because many later-wave skiers take several hours to get to Hayward, and darkness falls around 10. I would bet the Birkie staff is thanking their lucky stars this morning that they don’t have to deal with the logistics of a -30 race start. One of the great things about the Birkie is that you ski in whatever weather is thrown your way. 18″ of snow? Ski it. -11˚? Ski it. But it’s especially nice when it’s not brutally cold, or when you don’t have to push your car out of a snowbank the morning of the race. It won’t always be 2010-esque (10 at the start, 30 at the end, sunny on the lake) but we haven’t had a year with even moderate weather in quite some time. And that might change, although it looks like we’ll be incredibly lucky. While last year the Upper Midwest was in the center of the cold air in the US and got shellacked with snow and cold, this year it’s more on the western edge. There’s less moisture but, at least in the past few weeks, no shortage of cold. 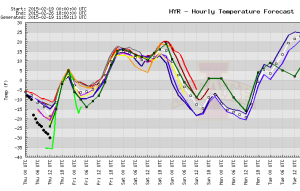 Much of this month will dip below 0 in Hayward, and the next week or so looks especially cold. Hayward looks to go well below zero five of the next six months, and readings of -15 or -20 are not out of the question. The one exception? Birkie morning. It might be downright balmy! A small disturbance will add a bit of fresh snow to the course (maybe even a post-grooming blanket to soften the well-packed base) and also keep temperatures from free-falling. Temperatures should drop to about 5 overnight, and rise to 15 during the race. Considering the rest of the week, this will be warm. Winds look to be light, and maybe even out of the north—a slight tail wind to propel us to Hayward. In any case, a repeat of 2011 (frigid Birkie) or 2014 (the blizzard) are not likely in the cards. It should be a much easier race, logistically, and, compared to last year, physically as well. That’s Norwegian for “Birkie Trail.” And today, on a rest day from Ski Orienteering World Championships, we drove up the road past the Lillehammer Olympic Stadium and, that’s right, skied on the real, actual Birkie Trail. Let me tell you this: if you haven’t gone skiing in Norway put that on your list. Even in the fog today, the trails were freshly prepared, fast and beautiful. And apparently there are views when you can see more than 50 feet in any direction. Two more races, then back to Snowtown a.k.a. Boston, Mass. Also, if anyone wants, Triacs here are $320 (well, the equivalent in Kroner). 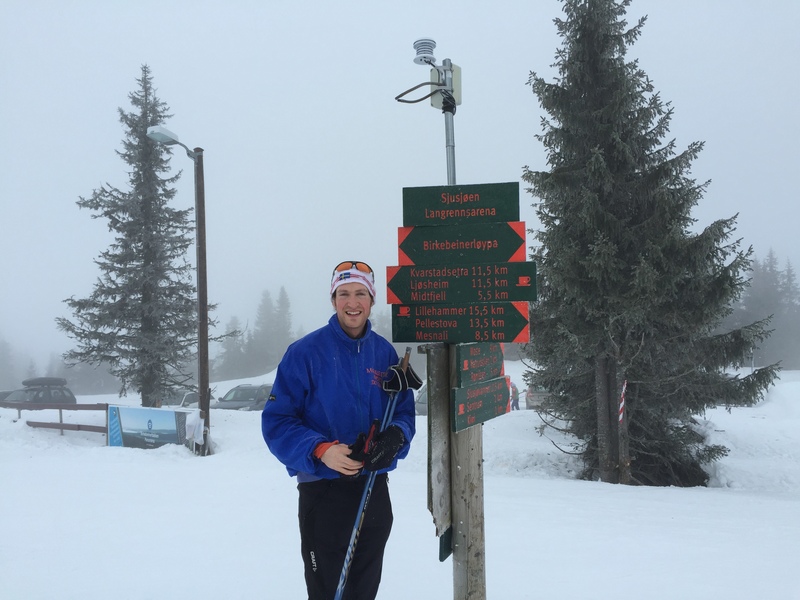 None long enough for me, but if you’re skiing less than 170 cm, let me know. Taxes included. Weather speculation: Cold. Dry and cold until the Birkie. Nothing on the horizon anywhere near freezing, so it should be skiing on what’s there, which is plenty. In the past people have said “oh, cold and dry, it will be rock solid.” Those people forget that there is a veritable Armada of Pisten Bullys preparing the trail. Expect it to be firm but pliable. And expec tthe race to go off as planned. Of course, we could have 18″ of snow the night before. But the way this season is going so far, I’d expect that in Boston.